spoiled - vain - power-hungry - entitled Weaver has the personality of a princess that believes the world should be hers. She does not, however, expect it to be handed to her on a silver platter. She will work for it, and is not against getting dirty or fighting for the things she wants. In addition, Weaver is the type of beautiful that knows it and wears it on her sleeve, and will use it (along with anything else she can) to her advantage. 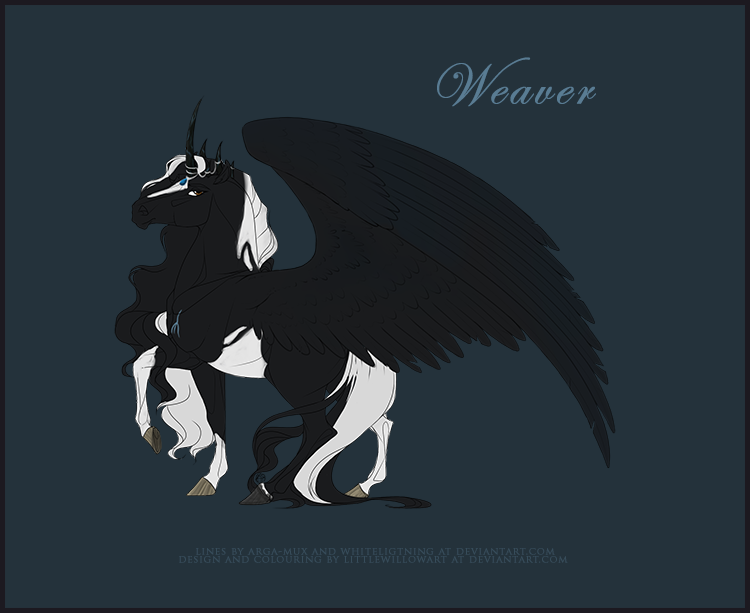 Weaver is the daughter of Queen Straia. When she was only a filly, she stumbled into a quest to stop the four horsemen of the apocalypse. In the end, she willingly gave herself to Death, and was able to stop him. She now bears the seal of death on her chest, and was granted the power of resurrection. This piece of magic has always made her feel invincible, and she is likely to take stupid risks. Not long after her escape from Death, her mother began a war in their homelands that left every kingdom bloodied and beaten. Weaver was taken hostage and her memory was wiped (though eventually, most of her memories were returned to her). Her mother abdicated the throne and their kingdom was destroyed. Weaver decided it was time find a new home, and ends up in Helovia. Email: Send Weaver an email.